Surging demand for fast moving consumer goods (FMCG) in Pakistan is attracting hundreds of millions of dollars of new investments. Expanding middle class, particularly millennials with rising disposable incomes, is demanding branded and packaged consumer goods ranging from personal and baby care items to food and beverage products. Rapid growth in sales of consumer products and services is driving other sectors, including retail, e-commerce, paper and packaging, advertising, media, sports and entertainment. Planet Retail estimates Pakistan's current retail market size at $152 billion. It is forecast to expand 8.2% a year through 2016-2021 as average disposable income has doubled since 2010, according to research group Euromonitor International as reported by Bloomberg News. Dutch consumer giant Unilever has announced plans to invest $120 million to expand its operations in Pakistan. Turkish multinational Hayat Kimya has said it will invest $150 million to manufacture consumer products in the country. Earlier in 2016, Dutch dairy giant FrieslandCampina acquired 51 % of Karachi-based Engro Foods Limited for $220 million. Rapid growth in sales of consumer products and services is driving other sectors, including retail, e-commerce, paper and packaging, advertising, media, sports and entertainment. Rising incomes of Pakistanis are reflected in the retail sales growth which is ranked the fastest in the world. Planet Retail estimates Pakistan's current retail market size at $152 billion. It is forecast to expand 8.2% a year through 2016-2021 as disposable income has doubled since 2010, according to research group Euromonitor International as reported by Bloomberg News. The size of the middle class is expected to surpass that of the U.K. and Italy in the forecast period, it said. Online sales are growing much faster than the brick-and-mortar retail sales. Adam Dawood of Yayvo online portal estimates that e-tail sales are doubling every year. He expects them to pass $1 billion in the current fiscal year (2017-18), two years earlier than the previous forecast. This is being enabled by increasing broadband penetration and new online payment options. Ant Financial, an Alibaba subsidiary, has just announced the purchase of 45% stake in Pakistan-based Telenor Microfinance Bank. Bloomberg is reporting that Alibaba is in serious talks to buy Daraz.pk, an online retailer in Pakistan. Advertising revenue has fueled media boom in Pakistan since early 2000s when Pakistan had just one television channel, according to the UK's Prospect Magazine. Today it has over 100. This boom has transformed the nation. The birth of privately owned commercial media has been enabled by the Musharraf-era deregulation, and funded by the tremendous growth in revenue from advertising targeted at the burgeoning urban middle class consumers. Sports and entertainment sectors are major beneficiaries of increasing advertising budgets. Commercial television channels' shows and serials are supported by advertisers. A quick look at Pakistan Super League 2018 matches reveals that all major consumer brand names are either directly sponsoring or buying advertising from broadcasters. These ads and sponsorship have turned PSL into a major business producing tens of millions of dollars in revenue to support cricket in Pakistan. Last year, Pakistan Cricket Board's budget was over $40 million and a big chunk of it came from PSL. This year, the PSL chairman Najam Sethi estimates the PSL franchise valuation is approaching half a billion US dollars with potentially significant revenue upside. There are a couple of downsides of the consumer boom. First, a dramatic increase in solid waste. Second, rising consumption could further depress Pakistan's already low private savings rate. FMCG products come with a significant amount of plastic and paper packaging that contribute to larger volume of trash. This will necessitate a more modern approach to solid waste disposal and recycling in Pakistani towns and cities. An absence of these systems will make the garbage situation much worse. It will pose increased environmental hazards. Pakistan's savings rate is already in teens, making it among the lowest in the world. Further decline could hurt investments necessary for faster economic growth. Pakistan's $152 billion retail market is the fastest growing in the world, according to Euromonitor. Expanding middle class, particularly millennials with rising disposable incomes, is demanding branded and packaged consumer goods ranging from personal and baby care items to food and beverage products. Strong demand for fast moving consumer goods is drawing large new investments of hundreds of millions of dollars. Rapid growth in sales of consumer products and services is driving other sectors, including retail, e-commerce, paper and packaging, advertising, media, sports and entertainment. Potential downsides of soaring consumption include increased amount of solid waste and decline in domestic savings and investment rates. I believe that soaring consumption and decline in domestic savings rate will increase demand of loan products. What are your views on this? Monis: "I believe that soaring consumption and decline in domestic savings rate will increase demand of loan products. What are your views on this?" Consumer debt in Pakistan is among the lowest in the world. There's a lot of room for consumer debt growth through mortgages, car loans, credit cards etc. But it requires greater financial inclusion. Hopefully fintech will help here. Maintaining a steady path and supported by an overall performance by key sectors, Pakistan’s economy has accomplished a decent growth rate of 5.79%, highest in 13 years since 2004-05 when it grew by 7.52%. With the rate of inflation still below 4% in the first nine months of the current fiscal year, this high-growth-low-inflation scene can be compared to a text book description of an economy at the take-off stage unless rising external vulnerabilities revert back to a crash landing and need for stabilisation during the upcoming political transition. Some critics may still like to highlight slippages on some targets including the GDP growth target itself 5.79% growth instead of the 6% target – and a particularly lower than anticipated output by the industrial sector. Yet it is heartening that the agriculture and services sectors performed better than targeted. This in fact partly compensated for the industrial sector’s growth. Most of the numbers approved by the National Accounts Committee for GDP performance are subject to the usual revision based on availability of actual numbers for the entire fiscal year. The rise in production of three important crops namely rice, sugarcane and cotton was estimated at 8.7%, 7.4%, and 11.8% respectively. On the contrary, decline in production, although provisional, was estimated at 4.4% for wheat crop and 7.1% for maize. Together, important crops posted a healthy growth rate of 3.57% against 2% target while other crops increased by 3.33% against 3.2% target. Cotton ginning also contributed significantly with a 8.72% growth rate compared to 6.5% target and last year’s growth of 5.6%. With 3.76% growth, livestock was close to 3.8% while forestry sub-sector stayed far behind the 10% target at 7.17% – almost half the 14.5% growth delivered last year. On the whole, the industry is estimated to have grown 5.8% against a target of 7.3% and revised growth of 5% last year. Here the manufacturing showed a 6.24% growth instead of the targeted 6.4% and 5.3% growth last year. Large scale manufacturing posted a 6.13% growth, slightly below its 6.3% target but much better than last year’s 5% increase. Major contributors to this growth were cement (12%), tractors (44.7%), trucks (24.41%) and petroleum products (10.26%). Construction, another priority sector of the current government, also increased by 9.13%, against 9% increase last year, and missed by a wide margin the target of 12.1%. The major contribution to 5.79% GDP growth rate came from 3.85% share from the services sector. The remaining 1.94% share to GDP came from industrial sector (1.21%) and agriculture (0.73%). The services sector has achieved 6.43% growth during current fiscal year second year in a row to have achieved above 6% growth but was primarily driven by general government services aka salary increases, inflation and other public sector expenditures. THE way we eat is under constant evolution. Food is no longer the tedious, labour-intensive affair of yesteryear in urban households. Ready-to-cook, store-bought items are steadily making their way onto our plates. The rising Pakistani urban middle-class and growing disposable incomes are accountable for this shift in dietary patterns. The Household Integrated Survey for 2015-16, conducted by the Pakistan Bureau of Statistics, reveals that the average monthly income of urban households rose from Rs38,923 previously to Rs45,283. It also shows that an average urban family spends around Rs15,000 monthly on food, of which readymade food contributes nearly five per cent. The lure of convenience when it comes to food is hard to resist for consumers as cityscapes in the country become increasingly peppered with supermarkets. “More and more middle-, upper-middle and upper-class consumers in urban areas are choosing to visit modern retailers, in particular for a new experience and for the bulk shopping of packaged food products,” according to Euromonitor International, a market research firm. Unsurprisingly, middle-class consumers “tend to consume far more meat, fish and dairy products”, according to a Deloitte report on the food value chain. With the surge of the processed food industry, small- and medium-sized companies such as K&N’s, Dawn, Menu, PK Livestock, and Big Bird have now become household names. The consumption of pulses in Pakistan has sharply declined from about 15kg per person a year to about 7kg per person a year, found a new report of the Food and Agriculture Organisation (FAO) of the United Nations. The report titled ‘State of Food and Agriculture in Asia and the Pacific Region’, reviewed pulse consumption in Pakistan, India, Sri Lanka and Bangladesh over the period from 1961 to 2013. It has been prepared for the FAO regional conference for Asia and the Pacific being held in Fiji on April 9-13. The report found that as countries became richer, populations were shifting from vegetable proteins — such as those found in pulses and beans — to more expensive animal source proteins such as those found in dairy products and meat. In India, during this period, the consumption of pulse declined from about 22kg per person in a year to about 15kg per person per year. The decline was consistent with trends elsewhere in the world. In Sri Lanka, however, pulse consumption seemed to have fluctuated between 5kg and 10kg per person per year since 1960, except for a sharp drop from 1970 to 1985, the report said. Pointing out challenges, it emphasised that the relative neglect of pulses, beans and other crops in agricultural policies in the region should be reversed so that the poor had relatively low-cost sources of protein and other micronutrients. The report pointed out that although overall cereal consumption per capita either declined or remained constant, within the cereal group itself there were important changes. Utilisation of rice and wheat for food increased — in some cases sharply — while total food utilisation of coarse cereals, which had been relatively important in the 1960s, either declined or remained steady, implying a fall in per capita consumption since the population was increasing. Citing example, the report said in East Asia rice and wheat utilisation for food was about 220 million tonnes per year in 2015, versus 20m tonnes per year for coarse cereals. Total utilisation of ‘superior’ cereals was still rising in 2013 mainly because of continuing population growth, even though per capita utilisation had started declining from the mid-1990s onwards, it added. The report put four South Asian countries — Bangladesh, India, Pakistan and Sri Lanka — below the red line, indicating that their calorie consumption was below the level that would be expected given their per capita household expenditure. In 2011-2013, only two (Mongolia and Pakistan) of the 26 countries had average intake of milk of 370 g/day or over. than 5 acres of irrigated and 10 acres of non-irrigated land). #Pakistan '#GDP rate rose to 5.8% in FY17-18': Pakistan's #economy grows at fastest rate in 13 years. Large Scale #Manufacturing up 6.13%. #Agriculture grew at a rate of 3.81%, while #industries and #services grew 5.8% and 6.43% respectively. "Energy, economy, elimination of extremism and education were the 'four Es' that we had discussed in our manifesto," Ahsan Iqbal said. "We created two plans ─ one was an immediate plan, the other was our Vision 2025," he explained. The PML-N government faced "major constraints and bottlenecks as a development framework was not present," he said. Despite this, the government had, over the last five years, allocated Rs47 billion to higher education, built 1,750 kilometres in motorways, and added 11,000 MegaWatts to the power grid. "We provided energy to industries so that the economy could grow. Record demand has been generated from [an increase in] energy in Pakistan." "The China-Pakistan Economic Corridor is a reality today. Of a total investment of $46bn, $39bn is being used to build roads and infrastructure." "We have used our own budget to curb terrorism, financing Operations Zarb-i-Azb and Raddul Fasaad," he said. Miftah Ismail said the government couldn't "possibly have given a budget for just three months." "What were we supposed to do? Raise salaries for three months, tell India to stop LoC firing for three months, and reduce taxes for three months? That is not how economics works. If we were to do this, it would have been a disservice to our country and we would not have been doing our jobs," he said. "The day the next government comes, it it has the right to change whatever it wants in the budget. Also, Ahsan Iqbal has left a Rs100bn block for the next government to spend on development as they please. 95pc of the same expenditures are faced by every government. Each government has to pay salaries and so on," he said. "You will see that all provinces will give their budget too, even though they are busy playing politics on the matter at the moment," Ismail added. Iqbal said: "The provinces have to give a budget that is based on expenditures. They are given revenues which mostly come from the federal government. The federal government has to define the country's economic policy for the next year. Through this, the industrialist decides the cost of production. How can we leave them without a budget?" The gross domestic product (GDP) grew at a rate of 5.8 per cent over the past year, Iqbal revealed, narrowly missing the PML-N's manifesto target of at least 6pc. "We would have achieved 6.1pc without political turmoil," he explained. "This is compared to an average of 3pc GDP growth" before the PML-N came to power in 2013. The momentum of growth remained above 5pc for the last two years running, reaching a 13-year high of 5.8pc in FY17-18 on the back of "strong performance in the agriculture, industrial and service sectors", Iqbal said. Agriculture grew at a rate of 3.81pc, while industries and services grew 5.8pc and 6.43pc respectively, he announced. The agri sector, saw the highest growth over the last 13 years, Iqbal said, explaining that the growth was achieved "on the back of initiatives such as expansion in credit to the sector, along with the Kissan Package, provision of better quality seeds including hybrid and high-yield varieties, and timely availability of agriculture inputs such as fertiliser, pesticides, etc." On the face of it, it was just another hair removal ad aimed at women in both Pakistan and India But this ad, like the others, would have slipped by unnoticed were it not for a social media uproar led by none other than Sana Mir, the former captain of the Pakistan women's cricket team. First uploaded on the product's YouTube channel on April 5, the ad for Veet Perfect Silk hair removal cream shows Pakistani actress Mahira Khan slinking onto a basketball court on a college campus. Even though she's wearing a tight pink dress and high heels, she handles the ball with ease and sinks it into the basket. As she accomplishes this feat, her arm brushes up against one of the other players, in athletic garb, who declares "wow" and then exclaims breathlessly, "So smooth!" "Not smooth," replies Khan. "Perfect!" Skin lightening and hair removal creams are some of the subcontinent's best-selling products, playing on the familiar insecurities South Asian women share on both sides of the border about body hair and the color of their skin. But when Sana Mir commented on the ad in a Facebook post on April 22, her post went viral — shared over 700 times from her official page and liked 28,000 times at last count. Mir opened her statement with a strong salvo: "To all young girls out there who aspire to take up sports. Make no mistake: you need strong arms, not smooth arms, on a sports field." She related how she'd refused to endorse similar beauty products because they objectify women "in different professional settings." Because this one involved sports and was clearly aimed at a younger crowd, Mir decided to speak up. "The worst thing is that instead of sending a message to young girls that the colour or texture of their skin does not matter, we are promoting body shaming and objectification," Mir wrote. She ended her post by requesting companies and the celebrities who endorse products to try and give girls the confidence to fulfill their dreams rather than making them feel self-conscious about their bodies. Both Indian and Pakistani women reacted enthusiastically to Mir's post, which she paired with jubilant images of the Pakistani women cricket's team performing on the field. Women called her a strong role model and bemoaned the pressure that women feel to look "perfect", thanks to advertisements for beauty products like these. Others lauded her for refusing sponsorship deals in the name of resisting body-shaming. "You're a real hero for refusing to compromise on values for sponsorship money," said Shahbano Aliani, from Karachi. Mir's protest comes at a time when Pakistani women are becoming increasingly aware of the sexism that keeps them in a position of lesser status. But there has been backlash. Some media painted Mir's statement as "slamming" Mahira Khan, predictably pitting two of Pakistan's most recognizable celebrities against each other. The PCB chairman has reported massive profits from the recently-concluded PSL. The Pakistan Cricket Board successfully completed the third edition of the Pakistan Super League with the eliminator and the finals of the tournament in two cities of Pakistan. Through the Pakistan Super League, the PCB is trying to bring back cricket to its soil which has been stranded ever since the attack on Sri Lankan players. Najam Sethi, the chairman of Pakistan Cricket Board (PCB) says that the tournament has been a massive success and the board is expecting to earn a revenue of around five million US dollars. Sethi was speaking to media after attending a meeting said that the third edition was bigger and better. According to Sethi while the 2nd edition brought them $2 million, the 3rd edition will give them around $5 million profit. “This time around [in the third edition], we are expecting over five million dollars as profit,” said the PCB chief. Sethi has already announced that most of the matches of the 4th edition of the tournament will be held in Pakistan. “You should trust me. I do what I say. Have finished one good news and am now giving the second,” he had said ahead of the PSL 2 final in Karachi. He also talked about the ongoing tussle with BCCI and said that they have already initiated the process of dispute resolution against the BCCI and they’re hoping to get it resolved soon. ICC has already created a 3-member bench to look into the matter. Sethi also spoke about the selection of the Pakistani squad for the tour of Ireland and England. The cricket fans in Pakistan are venting their anger over the exclusion of Fawad Alam from the squad. Sethi said that he never interferes in the selection process. He said that selection committee is fully independent and they have professionals to take correct decisions. MANILA: Asian Development Bank’s (ADB) former country director Werner Liepach said Pakistan will not need a bailout package as its economy was doing well, adding that there was no need to panic even as the current account deficit widens and foreign exchange reserves continue to fall. Addressing a media briefing at the 51st Annual Meeting of the ADB Board of Governors in Manila, Liepach said remittances continue to remain strong and would help meet external sector challenges. “Things are pretty much okay,” said Liepach. Overseas workers’ remittances touched a seven-month high at $1.77 billion in March 2018, which came on back of the second round of rupee devaluation, he added. In its latest quarterly report, the State Bank of Pakistan also anticipated that the country would attract a maximum of $20.5 billion in remittances in fiscal year 2018. Liepach, who is the director general ADB for Central and West Asia Regional Department, also maintained a positive outlook of Pakistan’s growth. He acknowledged that the budget deficit has gone up a little but it is “quite normal in election year”. Currently, the country’s budget deficit is projected to stand at 5.5% of GDP at the end of fiscal year 2018, while SBP-held foreign exchange reserves currently amount to $11.51 billion. Additionally, Pakistan’s current account deficit has continued to expand and the nine-month gap has increased to $12.03 billion. However, the ADB official remained optimistic. “What’s happened is that imports have gone up quite a lot due to increased economic activity related to the China-Pakistan Economic Corridor (CPEC), which is not a bad thing. He highlighted various factors that impact the growth of exports, including the overvalued exchange rate, which has been taken care of. “The latest information that I received is that exports are starting to pick up again,” he informed. Now, due to the early rise in imports followed by late pick-up of exports, there has to be a reaction in the foreign exchange reserves, which is of concern, but Pakistan has a way of financing its reserves and “there is no need to panic”. Stressing on ADB’s role, Liepach said the agency always gave policy-based loans to finance structural reforms, which in no way is a bailout. According to a study conducted by Standard Chartered Bank last year, between 2011 and 2015, the size of the retail pie in Pakistan jumped from $96 to $133 billion, a 38.5% increase. The current value of Pakistan’s retail sector is estimated at $152 billion, as per Planet Retail (a global retail consultancy). It is the third largest contributor to the economy (after agriculture and industry), accounts for 18% of the total GDP and is the second largest employer (after agriculture) providing jobs to more than 16% of the total labour force. 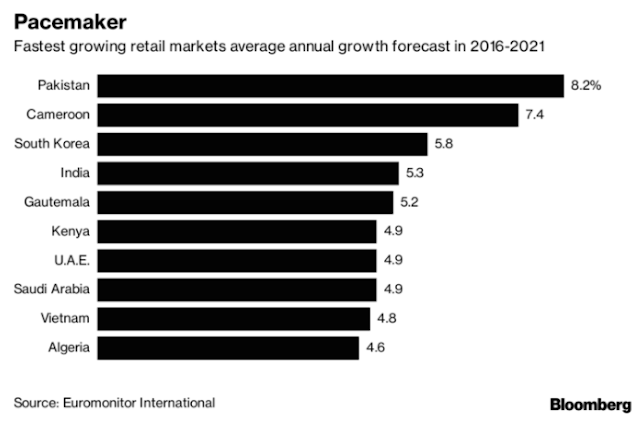 (NB: As most of retail in Pakistan is unorganised, therefore undocumented, industry analysts agree that the on-ground figures are much higher). With an annual growth of eight percent, retail sales are expected to cross the $200 million mark by the end of 2018. The main factor fuelling this, apart from increasing urbanisation, is an improving employment-to-population ratio which has led to higher disposable incomes, thereby expanding the middle class and increasing consumer spending manifold (estimated at $293 million in 2017 and projected to cross $333 million by 2018). The other trend disrupting traditional retail is e-commerce. Although still at a nascent stage, internet retail is expected to become a significant complement to brick-and-mortar grocery and non-grocery retailing in the coming years. Dolmen Centre in Tariq Road (established in the nineties), was the first vertical shopping complex in Pakistan built on a multiple floor layout. Before that the concept of indoor air-conditioned shopping areas was alien in Pakistan. If people wanted branded products, Zainab Market or Panorama and Rex Centres were the go-to places. However, the mall did not turn out the way it had been envisioned. There were not enough local brands because many did not want to assume the high rents Dolmen Centre demanded. It was almost a decade later that Pakistan had its first shopping mall, when Park Towers opened in Karachi. The mall morphed into a social venue, where people went to enjoy the amenities rather than to buy. The opening of Dolmen Mall Tariq Road in 2002 proved to be a game changer. Dolmen Group’s prior experience had taught them that the only way to convince the big names to come onboard as tenants was to ensure customer traffic. The two strategic decisions that paid off were the establishment of Sindbad’s Wonderland and a food court. Positioned as a family recreational spot, the mall began to bustle with activity convincing retailers to invest in space. Over the next 15 years, a number of malls were established (mostly in Karachi), redefining the shopping experience. The entry of Hyperstar in 2012 (operated by the Carrefour retail chain) as an anchor tenant at Dolmen Mall Clifton was another game changer. In the digital advertising space, business models for creative agencies are under increasing threat due to the entry of the big technology companies, says Amin Rammal. An Agency of Record (AOR) is commonly defined as an advertising agency authorised by an advertiser to buy advertising space and/or time on its behalf (businessdictionary.com). While this is still relevant from a media buying perspective, the adaptation of this concept in the creative, strategy and execution space may not be so intuitive in a digitally-driven, highly fragmented communications environment. The relevance of an offering (AOR or any other relationship) depends on what the customer (advertiser) needs. The traditional agency model was a strategic partner relationship with the advertiser to manage their brand communications providing strategic planning, creative idea generation, production, execution and media planning and buying. The AOR has been a prerogative of multinationals and large national clients. In Pakistan, multinationals adopt brand strategies developed at the global or regional level, with an aligned AOR. 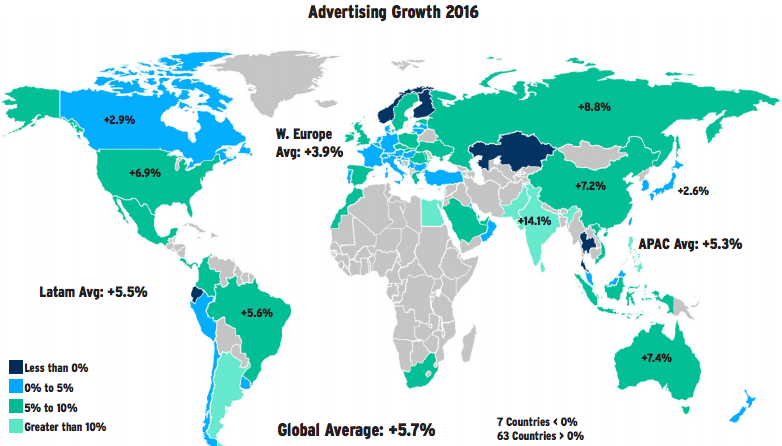 Major thematic campaigns are beginning to move in a similar direction, where the trend is towards global and regional creative. So the selection of AOR agencies by multinational clients is based on regional or global agency alignment. The local agency affiliate is more execution or tactical focused. It is unlikely that this will change in the near future as multinationals are able to better synchronise and manage cost with globally or regionally aligned AORs. Very few local advertisers invest in strategic planning and the focus tends to be more on execution. In many cases, large local advertisers appoint AORs, but the selection is often driven by price or triggered by new decision-makers in the marketing department. They also tend to maintain flexibility by keeping a roster of execution agencies. In Pakistan, similar to the rest of the world, media planning and buying has become a specialised area thanks to the advent of media buying houses. Whether an advertiser selects a full-service agency or a media buying house to plan or buy media, economies of scale support the consolidation of media buying to a single or few entities. Hence the support for AOR in case of media, continues to stand for now. However, some media buying houses are offering creative services, particularly in the content area, by partnering with content producers or smaller creative agencies. While they act as a single AOR for the advertiser, they are forward integrating with smaller entities and freelancers. There are different permutations of AORs when dealing with specialist areas such as mass media versus digital, versus PR, versus activation. The decision is driven by the advertiser’s legacy system, the organisational structure and capabilities, the agency’s offering in the marketplace (full-service versus specialisation) and the cost structures of the industry. Although in the short term, the AOR model seems to be working in Pakistan with different variations, the debate brewing globally is will the concept of AOR continue as digital’s share of advertising grows? The answer depends on several factors. #HongKong’s #retail chain Cheong Hing plans to enter #Pakistan. Founded in 1960, the company's line of businesses include retail sale of home-furnishings such as china, glassware, and metal-ware for kitchen and table use. Hong Kong-based companies including a retail chain store planned to enter Pakistan following a bilateral treaty signed between the two countries last year to avoid double taxation that may boost annual foreign direct investment inflows from approximately $35 million, officials said on Tuesday. Officials at Trade Development Authority of Pakistan (TDAP) said Cheong Hing Limited intends to set up retail chain stores in Pakistan and currently in talks with different stakeholders. Founded in 1960, the company's line of businesses include retail sale of home-furnishings such as china, glassware, and metal-ware for kitchen and table use. Pakistan has witnessed arrival of some global retailers in the past few years, but local businesses still dominate the retail sector. Wholesale and retail trade accounts for around 20 percent of the country’s economy of $300 billion, according to the State Bank of Pakistan. Analysts said liberal FDI policy for retailing along with changing buying habits would continue to provide enough opportunities to global retailers to explore Pakistan’s market for any investment and expansion plan. New chains of grocery and lifestyle stores are likely to enter primarily in urban centres, while chains of retail outlets irrespective of channel are likely to continue expand their network. Late last year, Pakistan and Hong Kong ratified a treaty to stave off double taxation on incomes of their individuals and companies. TDAP officials said Hong Kong’s Aalpes Global Group, which is in the business of creative planning, intends to set up company in Pakistan to expand business technology. An official said Pakistan’s mission in Hong Kong is building its connection with the Securities and Exchange Commission of Pakistan. Besides, Sino-German Safety Science and Technology Industrial Park Company intends to study information technology market, and is already in talks with the local stakeholders. Pakistan is one of the most liberal foreign investment regimes in South Asia with 100 percent foreign equity permitted in the manufacturing and infrastructure development sectors. The country offers a number of tax incentives to FDI projects in several sectors, spanning infrastructure, electronics and information technology and telecommunication services. Hong Kong’s FDI flow to Pakistan was recorded at $34.5 million during the July 2017 to February 2018 period. PepsiCo plans to invest US$1 billion in Pakistan over the next five years, the PepsiCo Chief Executive Officer (CEO) for Asia, Middle East and North Africa (AMENA) Mike Spanos told Prime Minister Imran Khan in a meeting held in Islamabad late last month. Mr. Spanos led a delegation of senior executives, which included Aamer Sheikh, chief financial officer, PepsiCo AMENA and Furqan Ahmed Syed, vice president and general manager, PepsiCo Pakistan. Demonstrating PepsiCo’s ongoing commitment to Pakistan, Mr Spanos discussed plans for the PepsiCo system to invest US$1 billion over the next five years. The Prime Minister welcomed PepsiCo’s continued investment, and Mr. Spanos extended the company’s full support to the government on its socio-economic and reform agenda. The PepsiCo delegation noted the company’s appreciation for the government’s focused efforts towards providing a positive business climate for all companies operating in Pakistan. PepsiCo has been part of the business community in Pakistan for more than fifty years. 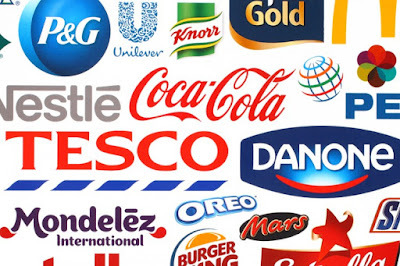 The PepsiCo system (including company-owned snacks business and franchised bottling partners and distributors) brings more than 60,000 direct and indirect employment opportunities to the citizens of Pakistan. Together, the system has invested more than US$800 million in the last five years. As one of the nation’s leading food and beverage companies, the company works with 160 Pakistani growers to purchase only locally-grown potatoes and corn for its products such as Lay’s and Kurkure. This supports an estimated 4,000 jobs while providing critical support for rural economies and empowering farmers with critical training on sustainable farming practices. Mr. Spanos extended an invitation to Prime Minister Imran Khan to inaugurate PepsiCo’s new snacks manufacturing facility in Multan early next year. The state-of-the-art facility represents an investment of US$66 million and is expected to create more than 1,500 direct and indirect employment opportunities for Pakistani citizens. Globalization Index: How Connected is Pakistan? Is Pakistan's Global Diplomacy Working?